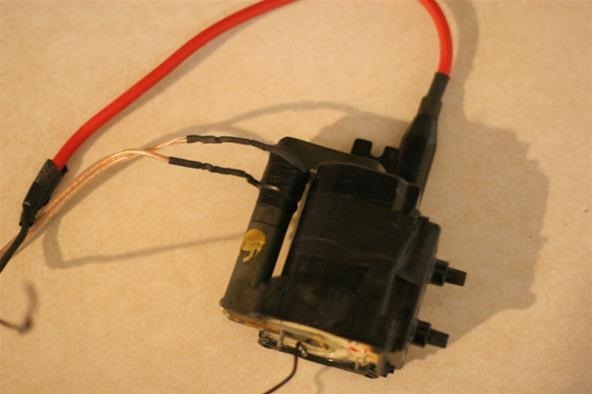 In this article, I'll show you how to built a Wireless Transfer of Energy Transmitter. Simply put, this device will send electricity to a florescent light bulb and light it up, from up to three feet. 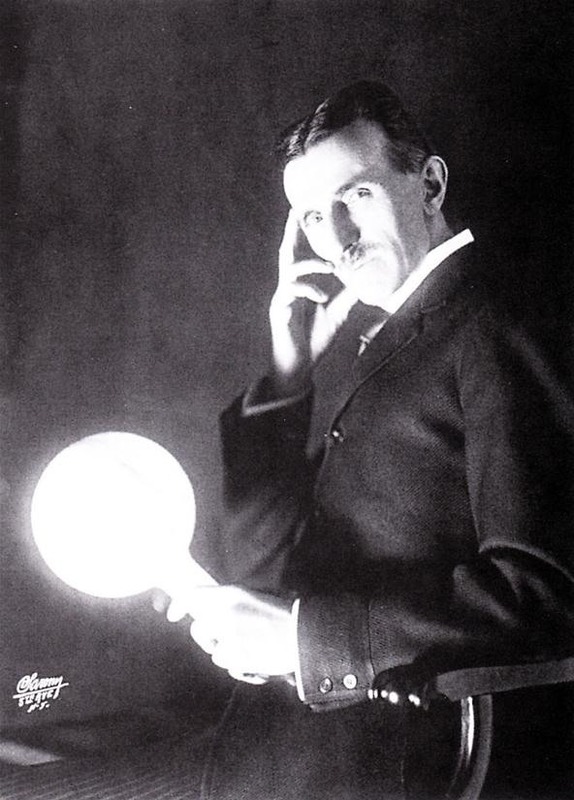 The idea originally (at least, prominently) came from Nikola Tesla (read more about this amazing inventor here), who used his Tesla coils to transfer wireless energy to light bulbs in demonstrations (photo below). However, the circuit described in this article consists of a flyback transformer, not a Tesla coil. They are similar in windings (large ratio between secondary and primary coils) and operation (both step-up voltage). However, Tesla coils have air-cores (no core) and flyback transformers have Ferrite cores. The components for this project can be extracted from most tube TVs. When finished, test it out CAREFULLY! The red wire should arc to a pin on the flyback transformer. This pin is the ground, note its location. Take the copper wire and bend it into a large loop. This isn't critical—feel free too experiment with the shape of the antenna. Now, solder the red wire from the flyback transformer to the copper antenna. Mound the entire circuit, transformer and antenna on something (like a plank or box etc). Solder a long wire to the ground of the transformer (noted above) and attach that wire to a grounded conductor (like the ground on the average wall socket). Basically, the electricity travels from the transformer through the antenna, then out into the "air". In the dark, this will be seen as something called corona loss, a dark blue "haze" of sparks flying off the antenna (BE CAREFUL, these will shock you if you come to close). HIGH VOLTAGE is dangerous!! Don't electrocute yourself. Soldering irons are hot! Don't burn yourself. I am not responsible for any danger or harm you cause. That's incredible. I don't see the wireless energy transmitter in the last photograph. 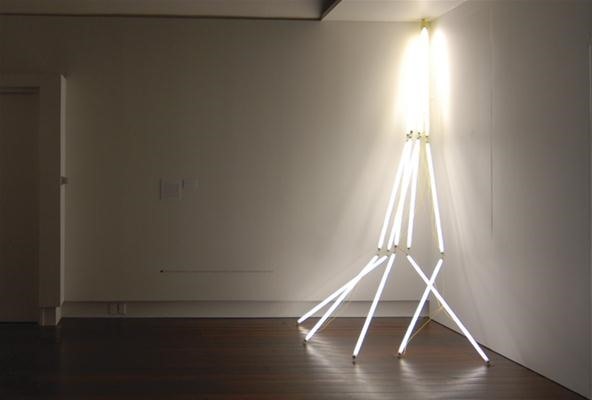 Can it really transmit enough energy to power that many light bulbs? Tesla was able to light up thousands of bulbs, many miles away using this. what would you suggest as a power source? a battery or phone charger? how can you make this more powerful? also where is the ground on the transformer? this is a process of trial and error, since it is different with every transformer. Once you have it powered up, CAREFULLY take the HV out and test to see which pin draws the biggest arc. that's your ground! and i do have a picture somewhere, ill link it here once i find it and upload it. It would be like a crystal radio, so yes. exactly! Though usually you lose quality, range and are subject to interference. yea dude you can! only problem is that the current type of high power transmission lines are linked to cancer. proven fact it causes cancer for folks that work or live super close to the super high power lines. So, dude, yea you can, but is your brain important to you? can I receive this wireless power using a receive coil to power up a small circuit using wireless power ?? or even just connect the receiving coil to multimeter to measure transferred power volt ?? 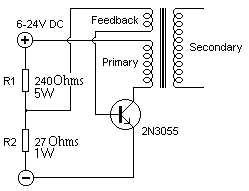 or this circuit is just useful for this kind of light work ?? your average multimeter is not designed to read tens of thousands or more volts. get a probe type meter that is made for it. heath kit made one that you should find cheaply on the common auction sites. adding a coil may not increase much. not enough current. and keep in mind that this works great with floresent lights, not incadecent. 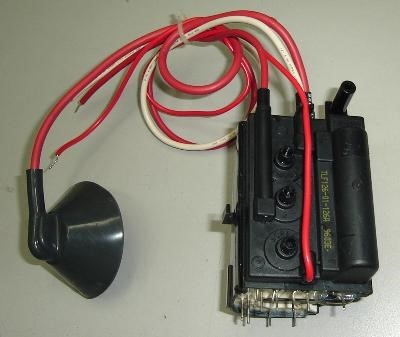 the CRT holds the charge, not the flyback transformer. 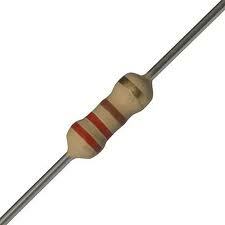 if you touch the hole on the tube where the flyback red wire went, it could send you across the room against your will! use caution. this is 10 to 40 thousand volts depending on size of the tube, and it bites like a wild beast, and has taken many lives over the years. what about this power Innovator that Dr Richard Goran is trying to sale on the internet for 49 dollars that can be installed in your home ? Is this the same thing he's trying to sale and where would you install it at in your house to be safe ?